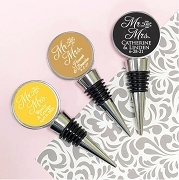 On the day your two loving hearts become forever joined, thank your guests for sharing the moment with these Cheers to a Great Combination Wine Set Favors. 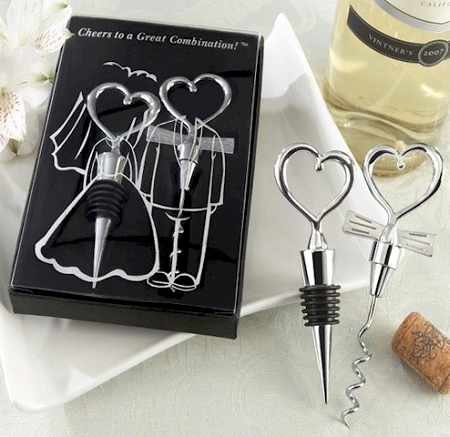 This whimsical wine set with its heartwarming design creatively celebrates the bride and groom's great combination! 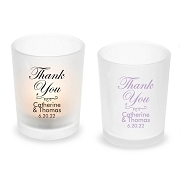 These chrome favors are solid chrome, with a notable weight and lasting quality, so they're perfect souvenirs of your special day. 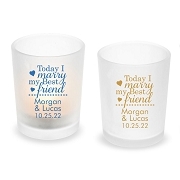 Gift box includes black, velvet-lined interior, black base and clear cover with playful bride-and-groom design and the words Cheers to a Great Combination! 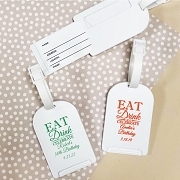 My wedding favors: perfectly fit, better than expected! Everything about my order worked perfectly. I was able to find what I want, get it at a very reasonable price, and have it arrive quickly. I am very happy!